Rudraprayag is a small town of Uttarakhand and derives its name from the word 'Rudra', an incarnation of the Hindu deity, Lord Shiva. According to Hindu mythology, Saint Narad Muni was blessed by the Rudra in this place. The town is situated on the convergence of the rivers, Mandakini and Alaknanda and is a major holy town. Devotees throng here around the year to pay homage to the Gods. Here is a guide to this holy city. 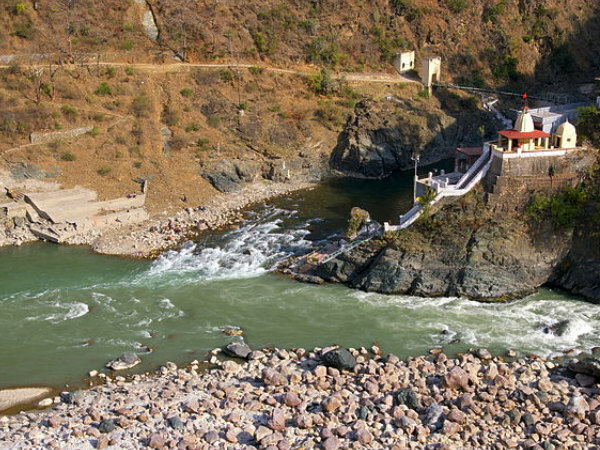 Rudraprayag Temple is a major religious centre located at the confluence of the two rivers namely, Alaknanda and Mandakini. Devoted to the Hindu God of destruction, Lord Shiva, this temple is visited by numerous visitors every year. According to mythology, Lord Shiva emerged here in the incarnation of 'Rudra' and blessed the Saint Narad, who had sought His blessings by virtue of penance to excel in the field of music. This place also offers the opportunity to visit the Jagdamba Temple located nearby. Triyuginarayan located in Rudraprayag is a holy place to visit. According to beliefs, it was the capital of Himvat, where Hindu God Lord Shiva married Goddess Parvati. Interestingly, the Havan Kund which was used for the marriage is still burning. It is believed that the ashes of the fire bless devotees with marital bliss. There is a Vishnu Temple located in the vicinity of this holy place. It has an architectural style similar to that of the Kedarnath Temple. Tourists visiting this place can also visit Rudrakund, Vishnukund, and Brahmakund. The Saraswati Kund is the source of these three kunds. According to beliefs, the water of this kund emerges from the naval of the Lord Vishnu. The place is also known for curing the infertility of women. Rudranath Temple is located at an elevation of 2286 m above sea level in Rudranath. The temple, dedicated to the Hindu Lord Shiva, holds a great religious significance among the Hindus. In the temple, the face of Lord Shiva is worshipped as Neelkantha Mahadeva. According to mythology, after the war of Mahabharata, Pandavas came to Himalayas to seek forgiveness from Lord Shiva for their sins. However, Lord Shiva did not wish to meet them and escaped in the form of Nandi Bull. The Pandavas spotted the bull in Guptakashi and tried to catch him but in vain. Later, Lord Shiva's body parts were discovered at five different places of the Garhwal region, which are known as Panch Kedar now. The Rudranath Temple stands on the spot where his face was found. The temple offers mesmerising views of Hathi Parvat, Nanda Devi, Nanda Ghunti, and Trishul to visitors. The holy tanks, namely Surya Kund, Chandra Kund, Tara Kund, and Mana Kund are located near the temple. By Air: The Jolly Grant Airport of Dehradun is the nearest air base located at a distance of 183 km from the Rudraprayag town. It is well connected with all the major cities in India. By Rail: The Rishikesh Railway Station is the nearest railhead to Rudraprayag. It is a small railway station with few trains. By Road: Tourists can also reach Rudraprayag by buses. This place is strategically located on the National Highway-58, which connects Delhi to Badrinath. During summers, all buses travelling from Delhi to Badrinath pass through Rudraprayag on the way to Joshimath. Regular buses are also available from Rishikesh to Rudraprayag. So when are you travelling to Rudraprayag?